Amusements Returning to Panama City? What's Schlitterbahn Up To Now? 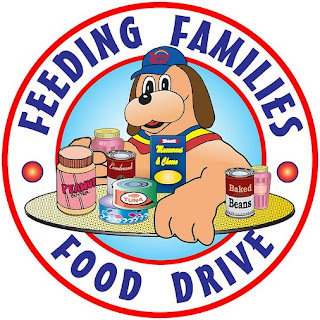 Holiday World has taken a bold step and decided to help local families by holding a food drive during the first two months of the season at the Indiana theme park. In May and June, each ticket holder who donates two or more canned food items will be given $5 in “Holibucks” to spend in the park that day. Holibucks may be used to purchase meals, snacks, games and souvenirs at Holiday World theme park and Splashin' Safari water park. The food items collected those months will be donated to food banks in Evansville, Indianapolis, Louisville and Nashville, Tennessee. Make sure if you're planning to visit you bring some goods for this wonderful cause. In a few words, the game plan seems to be 'stay the course.' Magic Springs and Crystal Falls water park are tackling today's tough economy by giving guests more of the same - fun rides, slides, concerts, entertainment, etc. While at first that may not sound exciting, being able to provide guests with an affordable getaway can make all the difference in where people choose to spend their extra cash. The park does not have any big additions this year, but is offering admission plans that help families save when they visit. The park also hints that while not much is new this year, they always have plans in the works for future additions. The park did expand their water park with new slide towers in both 2007 and 2008. 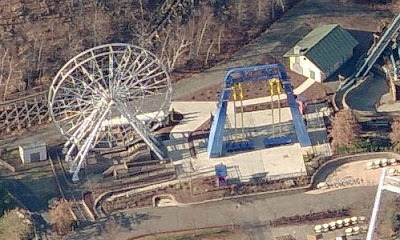 Rollercoasterpro.com has a great Manta update for us, it looks like the park has reopened a section of the walkway that goes directly underneath the coaster's track near the Pretzel Loop. The ride is really coming along in terms of landscaping and scenery as well. Sea World Orlando is really putting a lot of time and effort into making the ride look fantastic. See the whole update on RCPro here. The Orlando Sentinel also has up a great interview with the designer of Manta from Sea World Orlando, Brian Morrow. I'd check that one out, too. Hard Rock Park's former CEO Steve Goodwin says that he has intellectual property rights to the theme park and filed in bankruptcy court a request to receive $500,000 a year plus more depending on the park's revenues. Well, the judge in the case actually ruled in favor of Mr. Goodwin, however, he did not provide specifics about money - just the ruling that he has rights to intellectual property in the park. I certainly understand that a lot of time and effort was put into the park during the first year, but this seems like going against the flow of trying to get the park open this spring. Hopefully all parties can be satisfied so the focus on running the park can return. 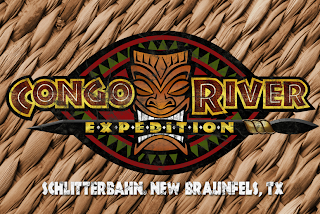 Schlitterbahn Waterpark Resort, located in New Braunfels, Texas, has announced a new attraction for the summer 2009 season, Congo River Expedition. Being called the most themed and immersive attraction in the history of the water park, the Expedition will treat riders to a 10 minute adventure down a mysterious river through a dense jungle with plenty of surprises along the way. The park has employed TBFX, Inc. to create many animatronic characters to be used in the attraction, as well as the design scenery. The attraction comes complete with unique storyline and soundtrack as well. To see more images and video, check out the official site for the new attraction. It looks pretty awesome! 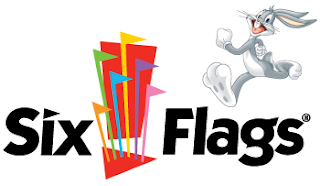 Six Flags' CEO Mark Shapiro has been one busy guy lately, it seems we're seeing different interviews with him published weekly - and all from different cities! It's all to spread the word that the company is still strong and the parks are open (or opening soon) for business like usual - and that three years of hard work transforming the properties is really paying off. Mr. Shapiro was on the Early Show this morning and gave a great interview about the parks. You have to love his confidence! Check it out, it's worth a watch. You want one - you know you do! On Opening Day, Saturday, April 18, the first 10,000 guests to challenge the new Diamondback roller coaster at Kings Island will receive a FREE limited edition First Rider T-Shirt. As if the ride alone wasn't enough, there's another ready to be at Kings Island on April 18th! Busch Gardens, located in Tampa, FL, is celebrating its 50th anniversary this year with a special 100 ft. long 'memory wall' that takes a unique look back at the first half-century of the park. Employees looked the park over for unique items to display on the wall, coming up with everything from old postcards to interesting costumes from days gone by. The display will run through the end of the year and will be available for viewing tomorrow. This article mentions that it will display some interesting concept artwork for attractions over the years which perks up my ears - hopefully someone will be able to grab shots of those! 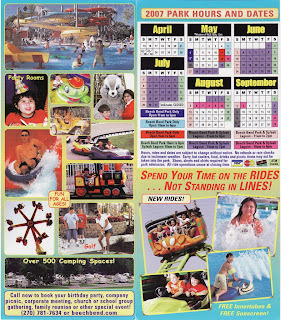 Lake Compounce, known as "New England's Family Theme Park," is located in Bristol, CT. Formerly owned by Kennywood Entertainment Company, the park is now part of the Parques Reunidos family. The park is very old, and touts itself as the oldest continually operating amusement park in America. That's not an easy title to come by! The classic wooden coaster originally opened in 1927, making it one of the oldest operating coasters anywhere. 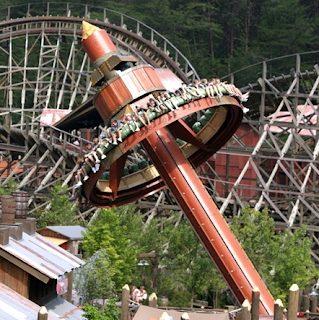 Originally designed by Herbert Schmeck and constructed by PTC, the ride was upgraded in 2007 to allow two train operation. 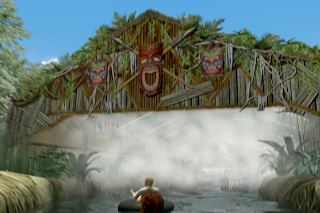 Also in the right side of this image you can see the park's Ghose Hunt interactive dark ride. It was opened in 1999 and created by Sally Dark Rides. The attraction was given a total overhaul just this past season. I think river rapids rides look so cool from the air. Here is Lake Compounce's version, aptly named Thunder Rapids. Added in 1997 it was built by Hopkins. A classic ride and a modern thrill - the park's Ferris Wheel sits next to Thunder n' Lightning, an S&S dual Screamin' Swing. Here is the park's water park that they wish to expand so badly. I think the waterslide that's built to look like a light house is a really neat idea. The slides that end directly into the lake are a cool idea, too. And here's the 'star' of the park, Boulder Dash. It's buried in the woods so you'll have to click on the larger image to really see it. The massive wooden coaster was built in 2000 by Custom Coasters. It sits perched on the side of a mountain and quite literally dashes past massive boulders while careening through the woods. 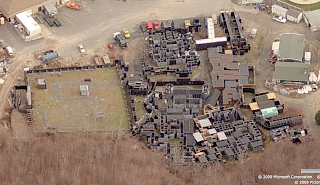 Here's a crazy image for you all, the above massive maze is the park's haunted house attraction, "The Haunted Graveyard." Open only during the Halloween season, the 45 minute walk through attraction is actually operated by Graveyard Productions, a prominent haunted house and prop manufacturer. And here's a link to the Live Local images! Cypress Gardens and it's water park, Splash Island, reopened yesterday to brisk business. 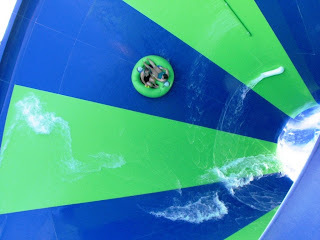 The new owners did not have time to add any new attractions to the water park, but they promise a large new ride in 2010. Even though the rides are gone and the park won't get much attention from the enthusiast side of things I'm certainly happy that Florida's original theme park is open again for the public! Six Flags St. Louis also opened yesterday for their 2009 season. While I haven't seen any reports from that opening (I think the weather was bad) - I did notice that SFSTL.net did recently have an update detailing what's new at the park this year. Seen above, the water park is adding Wahoo Racers, a Proslide mat racing slide. The park's Mr. Freeze coaster was also repainted a cool blue color. The park's Glow in the Park Parade is set to debut this summer as well. California's Great America is actually opening today for the season. The new attraction this year is the All Wheels Extreme show, but that won't open until June. Still no word on that planned wooden coaster either, I take it. Still, the park will also feature fireworks each Saturday during the month of August which is a nice surprise for guests. It's always wonderful to end the day at an amusement park with fireworks! Dollywood may have had to shelve their addition for 2009 due to the economy, but that didn't stop them from surprising us all and announcing a new addition just after the park's opening this weekend. The park will add SkyZip, a pay-extra hour long zip line adventure. The multiple zip line attraction will be unique to any theme park in the country, and have 5 lines ranging in length from 100 to 1,000 ft. The park says that they still plan to build the Adventure Mountain attraction in 2010. It appears as though the theme for Six Flags New England's Superman makeover may have been revealed thanks to a Dunkin Donuts! Read about and see images of the not-so bizarre makeover on the SFNEOnline forums. Carowinds opened for the 2009 season today and premiered their new coaster, the Carolina Cobra. 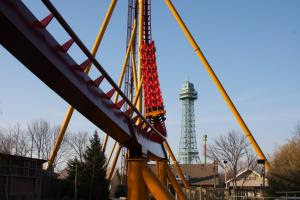 A user on the Carowinds Connection forums was invited to the coaster's media day and posted a great photo report of the event. Early reports are that the new trains the ride received are great and are much better in the rider comfort area. The Aerial Antics I published about Dreamworld in Australia got me thinking about the park's Giant Drop, a massive Intamin 390 ft. free fall on the side of the Tower of Terror. I was watching YouTube clips of the ride and came across the one above - obviously from some sort of TV show but it features some amazing clips and views of the ride. 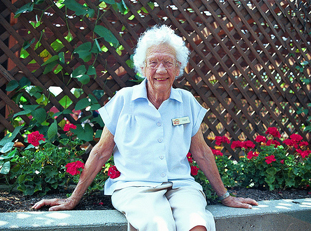 Starting in 1954, Foertsch literally worked her way around the park, at first in the kitchen and admissions, followed by sewing Santa suits and cleaning the park, and, for the past two decades, caring for the park’s flowers. In 2000, Foertsch was named Indiana’s Outstanding Older Worker by Green Thumb, Inc. The national organization sent her to Washington D.C. for a week’s celebration and featured her in their 2001 calendar. Foertsch was also included in a “60 Minutes” segment about older workers. While you may not be able to see Frieda working on the park's flowers, Holiday World opens for the 2009 season on May 2nd. 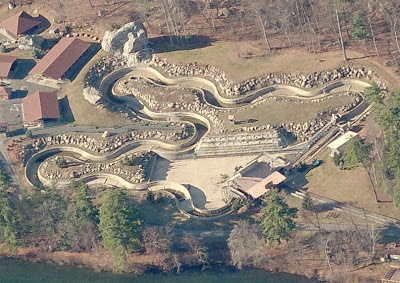 Lake Compounce, in Bristol, CT, was counting on a $3.3 million government grant that would allow the theme park to greatly expand their water park with new slides and attractions. But sadly, the grant was recently cancelled by the state's Governor along with around 300 others. Now the park is left with great expansion plans and no way to carry them out. The park plans to express their concern over the cancelled grant, but general opinion is that the decision will not be easily reversed. What a bummer! 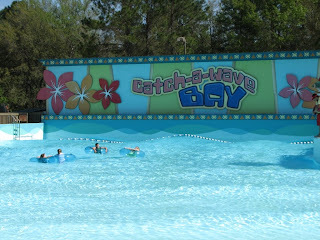 The park is adding to the water park this year however with the addition of the new "Tunnel Twisters" slide complex. They look like three enclosed Proslide tubes in nice bright colors. There's not much about them on the park's website, but you can see them on the new park map. Although disappointing, I'm sure the park will persevere in the long run. The amount of change going on in the Paradise Pier section of Disney's California Adventure lately is enormous. MintCrocodile has some really recent photos posted on their SmugMug gallery showing off some of these changes. The section's new Paradise Pier logo has been placed on the side of California Screamin' and looks really great. Work is still ongoing below the new sign, where a sun-burst type image will replace what has Mickey's head previously. Tons of heavy construction is taking place for the World of Color nightly lagoon show - as well as an expansive viewing area for it. Add to that continued work on Mickey's Fun Wheel - the park's ferris wheel - and the new games in that are and the place is quite busy! See Mint Crocodile's photos off all these changes here. So the Diamondback at Kings Island First Rider Auction is not even over yet, and it has already raised more than $75,000! Proceeds from the auction will benefit the non-profit organization A Kid Again, which is dedicated to providing fun-filled outings and on-going support to children with life threatening illnesses and their families. I've seen many parks have first rider actions, and they're always wonderful and successful as well - but these results are really staggering! 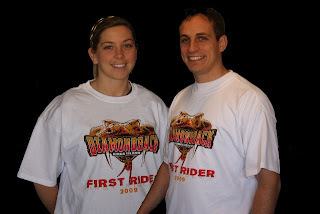 You can still get in on the action at the park's auction page for Diamondback. How would you like to lay claim to a piece of Waldameer's history? Well, now is your chance! 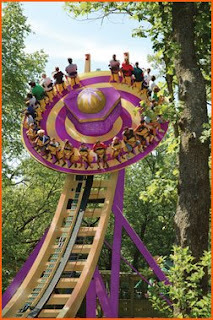 The park will welcome a shiny new Zamperla Mega Disk'O in 2009, and they want YOU to name it. A special announcement on the Waldablog served as the official kick-off for this long awaited contest. The winner and 23 of his/her closest friends will be treated to a Waldameer picnic on June 14, 2009. Be sure to check the Waldablog for all the details! The Funland Blog has once again broke some interesting Six Flags Magic Mountain news - this time it's regarding the theming going into the park's new Terminator: Salvation coaster. They're saying the park will spend an additional $1 million on theming the coaster, using audio and video that will feature the stars of the new mega movie of the same name. Great move! I think it's important to do all they can to connect 'wood coaster' to 'Terminator franchise!' Plenty more details here. Also, here's a really great article about Six Flags' recent usage of viral marketing to promote their theme parks' new ride and attractions. It covers all the work that was done for the Dark Knight coasters as well as the ongoing campaign for Six Flags New England and Six Flags Great Adventure's coaster makeovers. Deep in the heart of Kentucky, there is a river named Barren. Around its every bend you will find delightful rolling hills draped in scores of beech trees. But one bend in particular features a whole 'notha kind of wooden masterpiece! If you're interested in more than just rides, you're in luck at Beech Bend. This fun spot also features a water park, go carts, mini golf, and even an oval racetrack and drag strip. 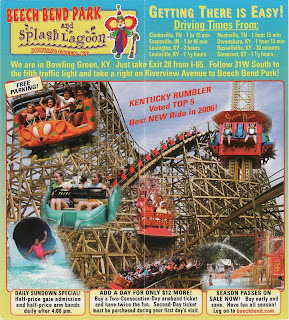 But in 2007, the main event was most definitely the park's one-year-old GCI wooden wonder, Kentucky Rumbler. The Kentucky Rumbler undeniably put Beech Bend on the enthusiast map. But did you know that "Kentucky's Hometown Park" has actually been welcoming guests since 1898?! 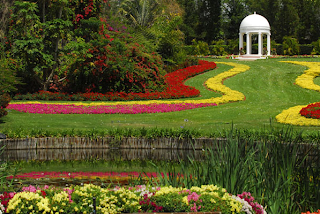 This charming traditional park fills its niche well and continues to capture the hearts of families year after year. The "Driving Times" listed in this brochure provide some insight into the prime market area that Beech Bend aims to capture. For a minimal gate admission fee, you can enjoy everything Beech Bend has to offer with the exception of the rides. Ride tickets can be purchased a la carte, or you can simply "upgrade" your admission to include an unlimited rides armband. Splash Lagoon may be small compared to the water parks you'll find at the chain parks, but it's still pretty amazing that it's included in the general admission cost. If you're not into rides, that's a pretty sweet deal! You've gotta love a park that's big enough to feature modern, exciting rides such as the Kentucky Rumbler, Wild Mouse, and Power Surge, yet small enough that you'll never have to wait too long to experience them. In many ways, this brochure is reminiscent of the park itself: It's small, but it packs a big punch. Let's hope that Beech Bend and its brochures continue to get bigger and better! The time has come for me to take Sabrina's suggestion to heart and make my ever present obsession with Live Local and Google's aerial photography a regular feature here on NewsPlusNotes. And with that we'll call it Aerial Antics because I also enjoy alliteration. I'll try to publish one weekly and you can find them under the new Aerial Antics tag. Dreamworld is located on the Gold Coast of Australia. I remember it obtaining most of it's notoriety by building the Tower of Terror back in 1997. The ToT is a clone of Superman at Six Flags Magic Mountain. Speaking of the Tower of Terror, here it is in the above photo. 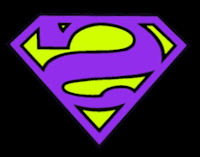 Technically it opened before Superman at Magic Mountain, making it the first coaster to hit 100 m.p.h. The park slapped a free fall, named Giant Drop, on the tower in 1998 and then also had the world's tallest free fall at 390 ft or so. But also in the above photo is the park's latest coaster: Mick Doohan's Motocoaster. 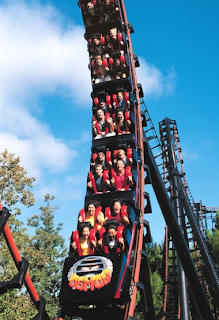 Opened in 2007, the launched motorcycle seating style ride was built by Intamin. We can see that the ride's layout is pretty much a double figure eight. The park also has a Nickelodeon Central section of the park, which is extremely similar to what was built at several of the former Paramount parks in the early 2000s. They even have a Rugrats Runaway Reptar jr. inverted coaster by Vekoma! They also created a Wiggles World years before Six Flags built them at their U.S. parks. Again the design is similar, even down to the entrance sign you can see and the brightly colored pavement. The rides and attractions are quite similar, too - Big Red Car Ride, Captain Feathersword's Ship, etc. Whitewater World is the park's huge water park, opened in 2006. Talk about an awesome selection of water slides! They've got one of everything it seems, a Tornado, a water coaster, Flowrider, and more! Also you can see how the water park slides wrap around the theme park's Cyclone roller coaster. The ride was relocated from Luna Park where it was called the Big Dipper. Here's a link to Google's images. Wild Adventures' Splash Island Opens This Weekend! Wild Adventures Theme Park, in Valdosta, GA, is ready to officially open their newly renovated Splash Island water park this coming weekend for the 2009 season. The park had a preview day this past weekend for season pass holders who wanted to check out the newly renovated Splash Island water park - and take a spin on the Wahee Cyclone, pictured below. Splash Island is a totally re-themed water park with additions and improvements to enhance guests’ tropical experience. The water park offers guests twelve-acres of wet fun with more than ten water activities, including six water slides, tropical lagoons, a 1,000-foot lazy river, a special area just for kids, and a 20,000 square-foot wave pool. The park also recently debuted an all new website, which is a really nice upgrade. I'm lovin' the new park map, too! 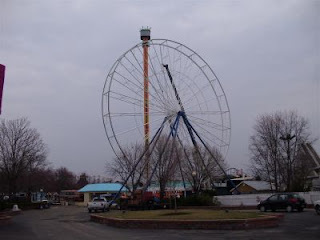 Quassy Amusement Park kicks off its 101st season of operation on April 25, and the park's staff is working hard to ensure that this happy occasion will be properly commemorated. Throughout opening weekend (April 25-26), the park will offer a $30 carload special whereby you can load the family truckster with up to 10 people and all members of your party will receive an all-day ride wristband for only $30, TOTAL! (And by the way, that includes parking!) The best part about this special offer is that it will benefit the Greater Waterbury Campership Fund, which helps send underprivileged children to summer camps. But the opening day festivities don't end at the front gate. Once inside the park, patrons will be treated to live entertainment, "meet and greet" sessions with Clifford the Big Red Dog, and Quassy's annual Egg Hunt (which will take place on Sunday, April 26). The kiddos also will be thrilled to see that Quassy's ever popular Playport (pictured above) has received a facelift during the off-season and now features even more play elements. The Paratrooper and train ride have been extensively refurbished during the winter months as well. Even the front gate itself is receiving the star treatment for the 2009 season, as Quassy will debut a brand new main entrance which has been designed to resemble the trolley station where guests used to disembark during the early days of this "trolley park". Don't let the nostalgia fool you, though--This new entrance will be fully functional and a big improvement over its predecessor. It will feature an information kiosk, numerous service windows for purchasing wristbands and ride tickets, and express lines for guests who have pre-purchased their tickets online or via group sales. I can't wait to see how it turns out! CBS Consumer Products has signed an agreement with three PARC Management properties to bring a new "Survivor: Live" stage show to the theme parks. Based on the hit reality TV series, the show will play at Elitch Gardens, Frontier City, and Darien Lake starting this Spring and run through the summer months. According to the article in Variety, "The half-hour "Survivor: Live" will use clips from the TV series -- as well as actors portraying previous contestants -- and divide the audience into four "tribes." Volunteers from the crowd will go through a series of four challenges, leading eventually to a sole winner." Personally, I love survivor and think this show will be really neat! But there's good news! 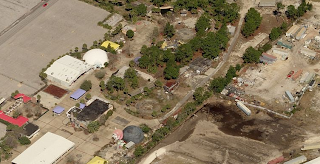 In addition to the existing Shipwreck Island water park, a new development is planned for the area that may one day bring amusement rides back to the beach. While not exactly on the land that occupied Miracle Strip, more up the road a bit, the new water park is being called "Emerald Coast Waterpark" and would span 13.5 acres. The potential for amusement rides, even a roller coaster, exists according to the mayor. Zoning changes are required for the park to be built, and if granted the property could open in 2010. How wild would it be if the Starliner returned to Panama City? Legoland California will add a new ride... or I should say attraction to their theme park this year in the form of a giant slide. The 30 ft. tall attraction will open on the 4th of July and be called Dune Raiders. Located in the Lost Adventure section of the park, the slide will be heavily themed to fit in with its surroundings. But wait there's more! Legoland California also recently received their next step of the approval processed for the new 250 room hotel they wish to build on their property. They're saying that the hotel is in their 10 year plans, so it's not something that's going to happen right away. Still, it's nice to see that further expansion is in their plans. Yippie for more park openings! 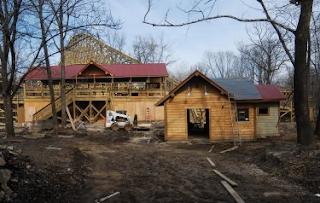 Silver Dollar City opened this past Thursday to a healthy crowd of 9,000 - more than the park was expecting. That's such positive news during these trying times. Hopefully more park openings will come with great results like this one. Hard Rock Park is still not officially Hard Rock Park. Confusing, but true. The park is trying to work with Hard Rock to keep the theme park's name, but hasn't been able to come to an agreement yet. Although the park had a rocky start to say the least, most agree that a name change would make the park's recovery even more difficult. Can you believe that Nickelodeon Universe at the Mall of America is already a year old? That went by pretty fast. To celebrate, the park is having a contest where 8 riders will try to outlast each other riding on the Spongebob Rock Bottom Plunge roller coaster in order to win a cruise for their family. Although the rides and critters are gone, Cypress Gardens is ready to reopen this coming Saturday. 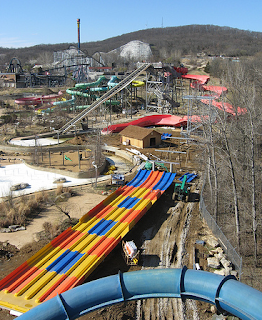 Season Pass and daily admission prices have been set, and the article says that 40,000 annuals have been replanted and the water ski show will be ready for opening day. Will the U.S. make it to the 2010 Shanghai World Expo? Still up in the air, sadly. 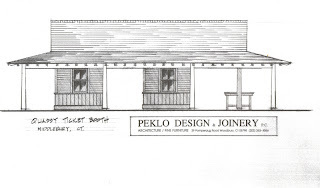 I really hope that things can be pulled together in time for America to have a pavilion at the event. 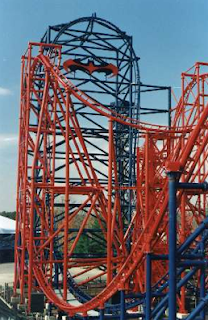 The Republican ran another story about the ongoing transformation of Superman Ride of Steel at Six Flags New England this weekend and it had some new details for us about the ride. Among these, it's said that the sound effects form the onboard speakers will change 4 or 5 times during the ride and coincide with special effects along the way. Also, the seats on the trains will be a little wider and the sides of the trains are now made of fiberglass, previously steel. These changes will make the ride different in several ways for passengers. I was nervous at first but now I think this awesome ride actually could be even better when it reopens! For more recent photos from SeeTheRide.com click here. 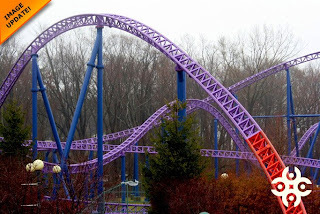 A cool off-season photo tour of Worlds of Fun was posted on WorldsofFun.org recently. They take a peek at all the changes being made and maintenance work going on around the park in order to get the place ready for opening weekend. And, of course, as seen above they were able to grab a shot of Prowler, too. So Cedar Point has cleared a section of land on the island that Millennium Force runs onto in the middle of the park - and needless to say fans of the Point are freaking out. Care to throw in your opinion of what wild ride Cedar Point will be adding as a direct result of cutting down trees? Go for it! I would love to go to Dollywood. And what wouldn't make that wish closer to coming true than to win some free tickets to the park? Coaster101 is giving away tickets, all you have to do is click over here and entry to win. If you're in Cincinnati this summer and you are looking for something to do check out Wake Nation. Wakeboarding is a quickly growing sport - and this new center allows riders to board without being pulled by a boat. It's a very interesting concept and sure to be a hit - check out their website for more details. I'm like a kid in a candy store when new park maps start showing up each spring. Cedar Fair parks have been updating theirs recently, I noticed that Kings Island's is available, along with Carowinds, and California's Great America's. 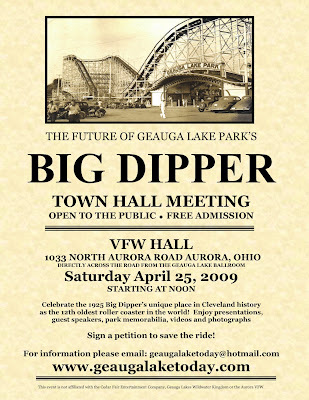 Geauga Lake fans should know that a mini-event is being held on April 25th across the street from the former amusement park to celebrate the park's history and discuss the Big Dipper's possible future. Meant not to be a whine fest, "the event is not intended to criticize in any way property owner Cedar Fair or the unknown individual who bought the Big Dipper at the June 2008 auction. Rather, it is meant to be a positive event that both celebrates Geauga Lake’s 120 year history as an amusement park and asks whether there is any way that future development of the park land could preserve some of remnants of that history." Should be interesting for those able to attend! 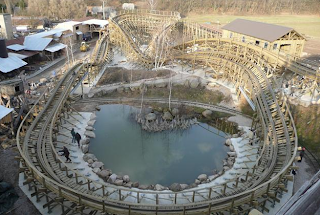 No not the one at Six Flags Great Adventure, I'm speaking of the new GCI wooden coaster that's opening soon at Forellehof Plohn, in Germany. Pretty nice, no? If you want you can see more photos like the one above at this link. Kings Dominion opens for the 2009 season April 4th, and the park is working hard to finish up their two new rides being opened this summer. First, Clawshun Industries has updated their website with new photos of the makeover they are doing for Medusa at Six Flags Great Adventure. There some cool little details you can gather from the new photos, like for instance it appears as though riders are going to have quite the 'heated' experience in the dive loop this year! Second, Great Adventure History just went on another off-season tour of Great Adventure to see the park preparing for their opening day. The park's Big Wheel is coming back together after a major refurbishment, and they highlight many changes throughout the rest of the park as well. Manta, SeaWorld's all-new flying coaster set to open May 22, glides and spins over the Orlando park on a recent round of test flights. An all-new breed of thrill ride-plus-up-close-animal-encounters, Manta combines the best of the sea and sky, immersing you in the beautiful and mysterious world of rays and then taking you for the ride of your life aboard a manta-inspired flying roller coaster. Fly, glide and soar headfirst like a ray aboard this unparalleled experienced that only SeaWorld could create. Six Flags Magic Mountain has some new photos of Terminator: Salvation up on their official website. The pics allow us new views of the ride's first drop from a perspective we haven't seen yet. Check those out here. Change is in the air for Hard Rock Park, this recent article has the new park owners stating that they do not plan to keep the park's Nights in White Satin dark ride operating as it does not fit in with a family appeal. The park does plan on adding more kiddie rides, though. Universal Studios Florida is almost ready to top off their new Rockit coaster, in the latest photos you can see that they've started to install the first drop. All that leaves is the vertical lift and the crest to install. Walt Disney World's Epcot recently started this year's International Flower & Garden Festival. If you've ever been to the theme park during this event you know how beautiful the displays are. The Orlando Sentinel has photos from the opening of the event. Worlds of Fun always has a Prowler update for us, don't they? The latest batch of photos features the ride's finishing details coming into place. The new wooden coaster will hopefully open with the park this April. CNN Money did a pretty neat feature story on Premier Rides which you can access via this link. Lots of interesting stuff in there about the company, and really the whole industry. It's not often that we get to read about the 'backside' of the industry where parks and manufacturers interact. One fact I'm hung up on though is Premier Ride's annual revenue being listed as $80 million. I'm not saying that I think that figure is right, or wrong, but what does this company possibly do to bring in that kind of cash each year? Something seems off there. Another great tidbit is that Giovanola left the business after having to spend too much money on getting Titan at Six Flags Over Texas up and operating, just like how X effectively killed Arrow Dynamics as well.